The ultimate test: Do livestock eat this feed? Yes. (Photo on Flickr by Swathi Sridharan/ICRISAT). 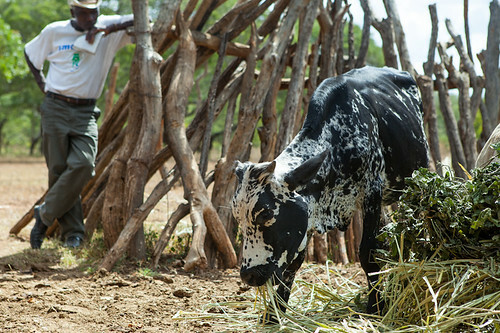 In 2012, three CGIAR centres — the International Livestock Research Institute (ILRI), based in Africa; the International Maize and Wheat Improvement Center (CIMMYT), based in Mexico; and the International Crops Research Institute for the Semi-Arid Tropics (ICRISAT), based in India — launched a joint project called ‘Integrating crops and livestock for improved food security and livelihoods in Zimbabwe, or ‘ZimCLIFS’ for short.